The times are changing faster than ever – technologically, demographically, socially, and economically. In the ongoing quest for relevance, it is imperative that organisations and leaders observe the changes, understand the shifts and respond to the trends. Mark McCrindle is an award winning social researcher, demographer, bestselling author, TEDx speaker and founder of McCrindle Research. Mark’s understanding of the key social trends as well as his engaging communication style places him in high demand in the press, on radio and on television shows, such as Sunrise, Today, ABC News 24, A Current Affair, and Today Tonight. You came to us already highly recommended as a keynote speaker, and that recommendation has been amply confirmed by your address at our event. Here are some quotes from the evaluations: “very inspiring”, “riveting”, “absolutely excellent”, and “captured and involved us all”. I want to thank you for playing a key role in our Conference. We all benefited from your input and I very much appreciate the contribution that you made. The feedback from your sessions at the CPA Congress has been tremendous. Here are some comments from attendees: “Brilliant- excellent presentation, good fun”, “Best so far”, Superb presenter- very informative and entertaining”, “Great speaker, well researched, excellent presenter”. Mark was excellent and very conscientious and sincere about getting the facts right. It was enough to whet the audiences appetite to come back for more. Mark was certainly a star. He is one of the best presenters I have seen in a long time. We have had nothing but favourable comments. Mark was lively, entertaining and very informative. His presentation fitted perfectly into our “customer” theme and opened the eyes of many of our attendees. We will certainly be using Mark as a presenter again. Mark can be relied upon to present his evidence-based research and findings with specific reference and connectedness to his audience. His presentations are relevant, responsive and relational and he clearly interprets the brief given to him prior to the event. The presentation was both informative and stimulating and was presented in Mark's trademark entertaining and easy-to-follow style. We received overwhelming response from attendees afterwards. It was excellent! The information and data was interesting and relevant, and he delivered it in a very engaging way. Everyone enjoyed it. Mark is one of Australia’s most sought after conference speakers because he brings research based content in a relevant, engaging way. From engaging new generations of staff to connecting with emerging consumers, from demographic change to social trends, Mark addresses the key topics affecting today’s organisations. As you will see from these recent speaking case studies, Mark is engaged to deliver sessions in a variety of forums, from executive sessions around a board table through to large scale international conferences. As researchers, not only do we deliver research-based presentations but we can incorporate research processes into the sessions, such as interactive voting technology. We also regularly conduct “state of the industry” research by surveying delegates and leaders before the event and sharing the insights in the conference presentations. Mark is an award-winning social researcher, best-selling author, and influential thought leader, and is regularly commissioned to deliver strategy and advice to the boards and executive committees of some of Australia’s leading organisations. His research firm counts amongst its clients more than 100 of Australia’s largest companies and his highly valued reports and infographics have developed his regard as an expert demographer, futurist and social commentator. What are Mark's equipment needs? Can we record or video Mark’s presentation? Yes, McCrindle Research grants permission to the client organisation to record the sessions and distribute them as long as they don’t sell the content. Can we have a copy of the visuals used in the presentation? Yes, simply request the slides or and we will make it available to be used, posted or distributed to the client organisation and the attendees. Can we request more copies of the demographic handouts you gave out? Yes, we regularly update the demographic map and handouts and hard copies can be posted on request, or electronic copies emailed out. Do we have to pay business class or economy? We fly economy — and discounted economy where possible. We keep our expenses to a minimum and business class is only required for international flights or for some long-haul domestic flights. Accommodation is only required if the program requires Mark arriving the night before or leaving the morning after the session. Ground transfers such as a rental car or taxis (whichever is cheaper) will be included if needed. All expenses are calculated before the event so that you know the exact amount you’ll pay upfront. Where can we buy Mark’s books? They are available from many bookshops, most online bookstores, and at mccrindle.com.au. However we recommend the provision of books to conference attendees as they are an excellent resource and can maximise the impact of the professional development session therefore we provide books as part of a Speaking Booking at a substantial discount. For more information or to check the availability of a date you may have in mind, please contact our offices. Once you have decided on your date and Mark as a speaker, we will send you a booking confirmation form for you to confirm all of the details and an invoice for a holding deposit. We will then arrange a briefing with your event organiser and Mark so that the topic and his presentation can be specifically prepared to meet your objectives. If specific research has been requested as part of this booking, we will conduct the research, analyse the results and prepare the findings ready for the event. We will, in liaison with you, arrange any necessary travel and accommodation bookings and conduct a final briefing with the event organiser if required. After the completion of the event and any associated research project, we will touch base for any final feedback or briefing requested and send you the invoice for the agreed amount. Mark’s clients include some of the world’s biggest brands, best known companies, leading not-for-profits, and many government agencies. 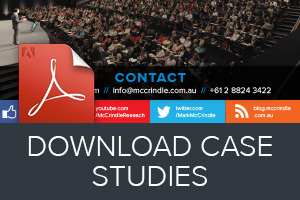 Mark McCrindle is variously described as a Futurist, Demographer, and Social Commentator. He is a National Statistics Excellence Award winner, TEDx speaker and is regarded as one of Australia’s foremost social researchers. He is a regular social and demographic commentator in the press, on radio and on news and current affairs television shows such as Sunrise, Today, ABC News 24, A Current Affair, and Today Tonight.